In all my years of leadership, there is one thing I have consistently experienced and that is…you learn 95% of what you teach. So as I write about the team value of positive attitude, be certain that I am writing to myself as much as I am writing to you. As the author of this post on Possessing A Positive Attitude, it might surprise you to learn that there are days when I have a negative attitude lurking inside of me all ready and willing to express itself. And by the way, so do you. When I think about people and the kind of attitude we have towards our own attitudes, unfortunately, I see far too many people having a half-hearted attitude. A couple of months ago, I came across a little quote that I think will help illustrate the kind of attitude many of us have about our own attitudes. It is this: “No sense in being pessimistic…it wouldn’t work anyway…” So what am I saying? I think we all know that we should have a positive attitude, but unfortunately, like the author of that quote, we don’t fully own the responsibility for our attitude. Do you know that if you write down the word A-T-T-I-T-U-D-E and note underneath each letter the numerical place in the alphabet that each letter represents (ie. A = 1 since it is the first letter in the Alphabet; hence, 1+20+20+9+20+21+4+5), the sum total of the numbers equals 100? This is a pretty interesting little fact that serves to remind us that we are each 100% responsible for the choice of our attitude – positive or negative. As servant leaders in the kingdom of God, you and I must possess a positive attitude because our attitudes are infectious. This is why I prefer to have the unofficial title of CMIHL [Chief Make It Happen Leader] over my official CAO title [Chief Administrative Officer] in my organization. My CAO title defines my official responsibilities as a Chief Administrative Officer – what I am supposed to do in the organization, but it really doesn’t define much about the way I will choose to do what I am supposed to do in the organization. You see, being a CMIHL says a lot about how I will choose to do what I am supposed to do as CAO. As a Chief Make It Happen Leader, I choose to serve others with a positive attitude to make things happen for our team, our members, and our guests. Being a CMIHL is actually all about serving others with a positive attitude. And guess what? Every person on a team has an official job title that defines what they are supposed to do in their job; however, a team value for possessing a positive attitude with a corresponding heart conviction will actually help inspire each person on a team to be someone who will serve others with a positive attitude. The Team Value is: Positive Attitude. The Heart Conviction is: We are servant leaders who possess a positive attitude. Let me illustrate by the wings of an airplane what it means to develop ourselves both technically and behaviorally. Years ago, when I was at a church leadership conference in California, I heard a great leader illustrate how truth and grace (representing 2 wings of a plane on the journey of Christian life) intersect at the cross. He said that if Christians only approached life in truth without grace, they would be flying on a plane with one wing of the gospel and having a perspective that everyone would be going to hell. On the other hand, if Christians only approached life in grace without truth, they would also be flying a plane with one wing of the gospel, but in the opposite direction and having a perspective that life could be one big party with no boundaries. However, in the Christian life, perfect truth meets perfect grace in Jesus at the cross which totally frees the Christian to soar in the journey of life on the two full wings of the gospel: perfect truth and perfect grace. As I pondered this teaching, I came to realize that the same airplane illustration could be used to describe the importance of developing people, technically and behaviorally, on the journey of leadership and people development. As leaders, if we only focus on developing people’s technical competencies, then people end up flying on a plane with one wing going round and round in circles and never really achieving their full potential. For instance, if someone is an interpreter and has developed their language skills to the level of being able to fluently speak 10 different foreign languages, but they never develop a positive attitude in life, they will keep going around the same mountain of personal failure and disappointment. It may be true that such a person is technically competent to fluently speak 10 different languages; but, if they possess a mean, rude, negative attitude…having the ability to speak 10 different languages only means that they can be fluently rude in 10 different ways. Such a person will never be promoted in life no matter how many languages they learn to speak. Does this make sense? Now the same is true on the behavioral side of leadership and people development. If a person only develops their behavioral competencies and never spends any time developing their technical competencies, then they are flying on a plane with one wing in the opposite direction going round and round in circles and never really achieving their full potential. For instance, a pilot can be the nicest person in the world, perhaps bringing everyone on the plane homemade brownies from his wife; however, if he has only flown small commuter prop airplanes and doesn’t know how to fly large commercial jet airliners, I’m not getting on a commercial jet airliner with that pilot in the cockpit. It doesn’t matter how nice someone may be, if they are not competent to do their job, they will find themselves never fully reaching their growth potential. BUT, when people develop their technical competencies and also their behavioral competencies, they actually build a plane with two wings that will allow them to soar to ever increasing heights of leadership development and growth potential. So let me be clear. 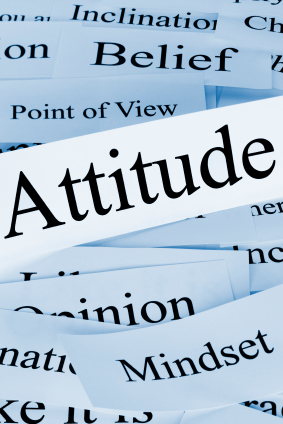 Possessing a positive attitude is a huge component in developing an exceptional behavioral competency and as coaching leaders, we cannot ignore that aspect of personal development for each person on our team. Now let me ask this question. What do you think is the biggest reason why people go around with a mean, rude, and negative attitude? Personally, I think one of the biggest reasons that someone will do this is because of unresolved unmet expectations in their life. Proverbs 13:12 states, “Hope deferred makes the heart sick, but a dream fulfilled is a tree of life.” Unfortunately, when someone is let down and they do not get that matter resolved in their heart, a bitter root can grow that causes them to possess a negative attitude towards life. For example, someone at work is expecting a promotion and it doesn’t come. Or maybe someone else gets the promotion. Either way, the expectation of being promoted remains unmet and furthermore, the longer that expectation remains unmet and unresolved in that person’s life, it can eventually turn into a sour root that begins to express itself in the form of a negative attitude towards life and people. I find it hard to have an unresolved unmet expectation in my heart when I make a conscious decision to not judge someone whom has failed to meet my expectation. The key word here is unresolved. While an expectation may be unmet, it doesn’t have to stay unresolved in my heart through judgment towards the person that failed to meet my expectation. Now add to that the extension of forgiveness towards them when I am hurt by their failure to meet my expectations, I find that this will pretty well insulate my heart from embracing a sour negative attitude towards life and others. Furthermore, as bone-fide Christ followers, let me encourage you with 3 great reasons why you and I have no excuse for possessing a negative attitude in life. 1) We have the Holy Spirit living inside of us. 2) We have the Word of God and all of its promises are Yes and Amen in Christ Jesus through us. 3) We have the ability to pray and commune with our heavenly Father anytime, day or night. Writing to the Corinthians, the apostle Paul states in 2 Corinthians 4:7-10, “We now have this light shining in our hearts, but we ourselves are like fragile clay jars containing this great treasure. This makes it clear that our great power is from God, not from ourselves. We are pressed on every side by troubles, but we are not crushed. We are perplexed, but not driven to despair. We are hunted down, but never abandoned by God. We get knocked down, but we are not destroyed. Through suffering, our bodies continue to share in the death of Jesus so that the life of Jesus may also be seen in our bodies.” Regardless of our circumstances in life, the apostle Paul tells us that we have a great power from God that shines in our hearts. This great power is the Holy Spirit which empowers all Christ followers with the ability to have a positive attitude despite any negative, adverse, or challenging situation in life. Furthermore, Jesus Himself tells us in John 16:33, “These things I have spoken to you, that in Me you may have peace. In the world you will have tribulation; but be of good cheer, I have overcome the world.” With faith in Christ and the Holy Spirit living inside of us, you and I have everything we need to possess a positive attitude in life! Possessing A Positive Attitude Copyright 2013, The Make It Happen Learning Institute. You have permission to reprint the leadership article, Possessing A Positive Attitude, in its entirety only, and forward to your colleagues and friends, provided the copyright notice remains part of the reprint and transmission. All other rights reserved. Thank you Brian! You are a great friend with a great positive attitude! Many blessings!